King Dollar could bend but not break, as long as central banks' imbalances persist. Political turmoil in the Old Continent will continue to underpin the DXY. The American dollar is the overall winner this 2018, despite being battered in these last days of the year. The DXY recovered from a yearly low of 88.25 achieved early February to a 17-month high of 97.71 in December, now battling in the mid 96s. Much of dollar strength came from the US Federal Reserve and its tightening policy, two steps ahead of any other central bank. But it also benefited from weakness somewhere else, mostly focused in political trouble in the Old Continent. Brexit, slowing economic growth and uncertainty, were probably the more used words when referring to Europe this year. The ongoing crisis in Italy and France are the cherries on the cake. The dollar index is a weighted geometric mean of the greenback compared to a basket of currencies, with the EUR and the GBP having roughly the 70% weight of its value. Canada and Australia kick-started the year on a strong footing, but plummeting oil prices and trade tensions between the US and China weighed more than encouraging local data. Only the CAD has some weight on the DXY but at the end of the day, all major currencies influence the dollar. What would the Fed do next? Back to the Federal Reserve, the market is still trying to assess how significant the latest decision has been. Chief Powell & Co. had delivered as promised and the only relevant change to their stance is that the dot-plot now anticipates two rate hikes for 2019 vs. three moves previously, as rates are now at the "lower band" of neutral. Would the pace of hikes be slowed further? That's the answered question that hits the dollar these days. There are two factors that skew the scale toward a "yes." US President Trump criticism and dislike of a stronger dollar, which drags economic growth, and equities slump, heading into year-end at multi-month lows. Investors confidence has deteriorated and needs to be restored. Should the Fed remain confident and delivers as expected, the advantage of the USD will prevail, and then the answer will be a "no." Of course, nothing is black and white here. The US Federal Reserve may have a good bunch of influence, but political developments in Europe will surely have their saying in the future of the greenback. Less than 100 days ahead of Brexit, the only thing clear is that nothing is clear when it comes to the divorce of the millennium. A hard landing will cause trouble not only in the kingdom but also in the Union, despite the tough stance of policymakers. Trade and financial disruptions are at the top of the worrisome list. 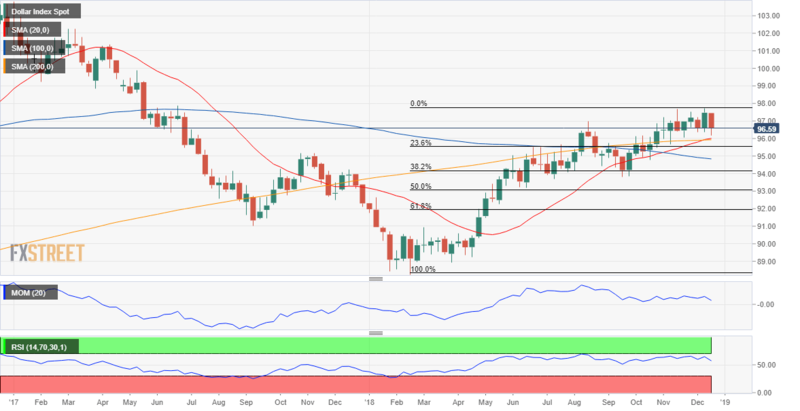 The Dollar Index has reached the 97.00 area late October, entering a consolidative stage clear in the weekly chart that extended into the last trading days of the year. The low of the range is 95.68 and the high 97.70, where it topped a couple of times ever since. The index is at a critical long-term resistance level, the 61.8% retracement of its monthly slump between 101.76, January 2017 high, and the low set on February 2018 at the mentioned 95.68. 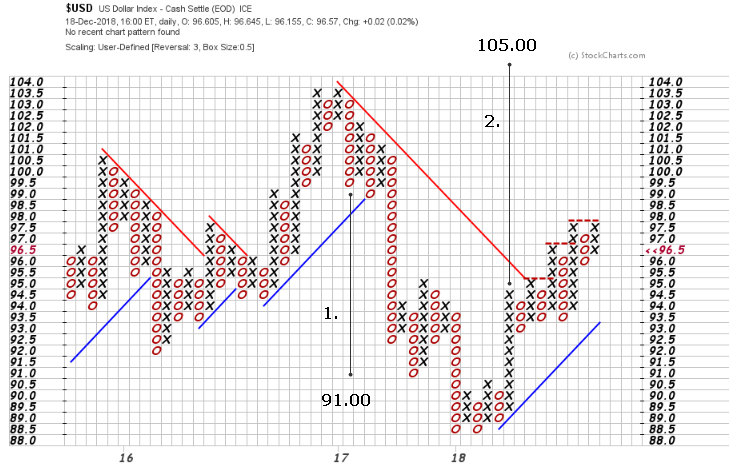 A firm advance beyond the level will be a strong bullish signal that could take the index up to 100/101. However, the dollar would need fundamental reasons, not yet at sight, to reach such levels. When looking at the weekly chart and this year rally, the 23.6% retracement comes at around 95.50, just below the base of the latest 7-week range, making of it quite a relevant support, as once broken, bulls discourage will increase while bears will rush into it. The upward potential is fading according to technical readings in this last chart, as indicators ease within positive levels, nearing their midlines after lacking directional strength for over two months. However, the same chart shows that the index is holding above its moving averages, which are contained within a well-limited range, but with the 20 SMA having already crossed above the 100 SMA and now aiming to surpass the 200 SMA, a sign that bulls are not giving up yet. The 38.2% retracement of this year run comes at around 94.20, providing a big line in the sand, as below it, the following decline will be clearer, targeting then 92.00, the 61.8% retracement of the same rally. 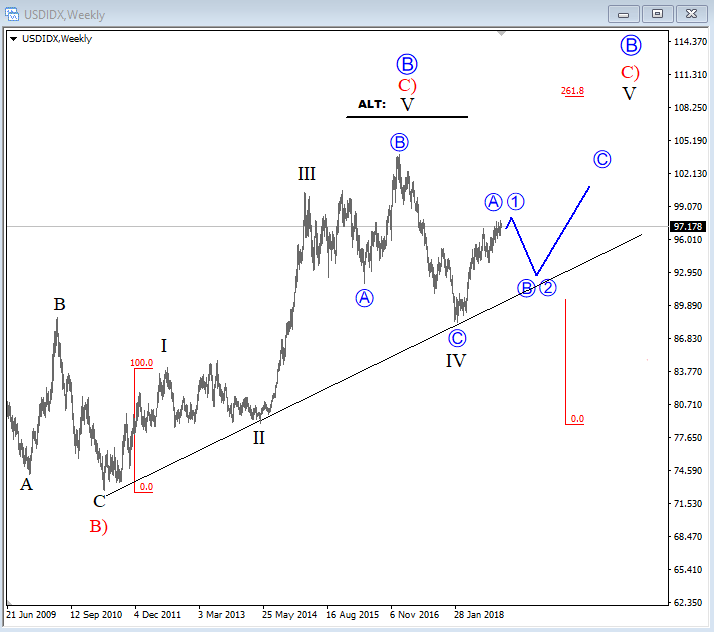 From a debilitating structure in 2017, the Dollar Index chart evolved into a recovery setup in 2018 suggesting a continuation of the recovery structures towards the unfilled target 2. at 105.00. Should this market maintain the same momentum levels seen in the deterioration, then it looks like it can restore all of the loss within the same time span. Creeping up past 98.00 would trigger the third consecutive buy signal and open the flood-gates for 105.00. USD Index is trading in a five-wave rally from 2011 lows, which can be part of higher degree red wave C). Specifically, we see price making a new recovery this year which can be a suggestion that corrective wave IV is completed and wave V in progress. But, similar as EURUSD, we may see a correction in the beginning of the upcoming year before a continuation higher. However, we don’t see any bearish evidences, so US Dollar remains bullish or at least sideways, but we believe that sooner or later new highs can be seen, while it’s trading above that strong trendline connected from 2010 lows.